Are your hamstrings tighter than the spandex on a 350lb wrestler? If so, you need to do something about it. The fact is, tight hamstrings are not good for you and in this post we’ll explore why. We’ll also look at how you can accurately test if you’ve got tight hamstrings. In part 2 we’ll look at the best hamstring stretches you can do to improve your flexibility. Quite simply, we spend far too long sitting down and not enough time up and about stretching and lengthening our hamstrings. You’re particularly prone to this if you’ve got a desk job. In this case, the vast majority of your time will be spent sitting at your chair and whiling the hours away until home-time. In a normal sitting position your hamstrings are in a contracted position and the more time you spend like this the more your muscle has the chance to shorten and lead to tightness. Walking regularly, staying mobile and stretching can help prevent this. But more on that below once we’ve convinced you that you need to do something about it. Tight hamstrings are unpleasant to suffer with. They can make the backs of your legs ache after a day of sitting down, and you can often feel them pulling tight as you do simple things, like standing up. Hamstrings that are stretched tight like an extended elastic band can be prone to spraining, straining or even seriously tearing when placed under stress. That can be doing anything from intensive games of sport, to simply running for that bus you need to catch. But the effects of a tight hamstring can be felt well beyond the muscle its self. As one of the largest muscles in your body, the hamstring can act like a big bully on other areas of the body when it is too tight. A tight hamstring can pull at your pelvis leading to lower back pain (though clearly lower back pain doesn’t necessarily just mean it’s a hamstring problem). Pulling at your pelvis like this can lead to all sorts of postural problems. Similarly, physios will tell you that tight hamstrings can also cause knee, calf or Achilles injuries. And nobody wants any of those. Addressing hamstring tightness is one of the most important way to prevent a variety of injuries and problems. The chances are that you already know if your hamstrings are tight, because you can feel it when you move in certain ways. You might even have been unlucky enough to have experienced a sprain or strain as a result. You may even be experiencing back or knee pain as a consequence of your tight hamstrings. But it doesn’t always happen that way. Many people have tight hamstrings without even knowing. So how can you tell if you need to be concerned? One very simple test is to try to touch your toes whilst keeping your knees straight. If you can’t do this (and your hamstrings feel like they’re burning as you try to do it) then they’re probably too tight. But if you want to get a bit more scientific, there’s a more accurate and reliable test known as the “Active Knee Extension” (AKE) test. 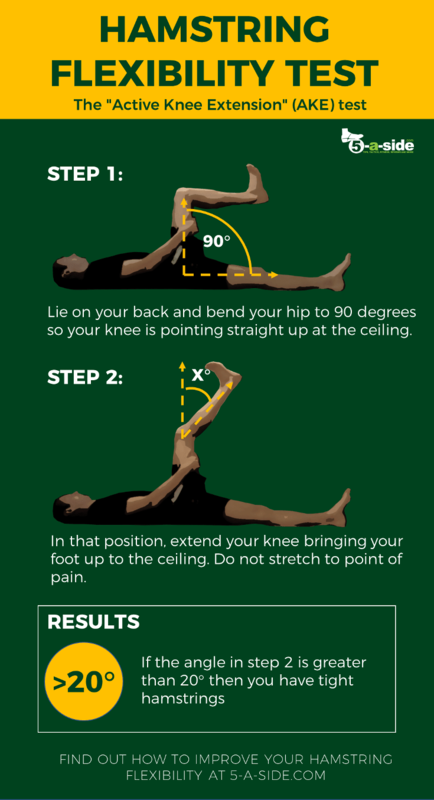 To do this, lie on your back and bend your hip to 90 degrees so your knee is pointing straight up at the ceiling. Then, in that position, extend your knee bringing your foot up to the ceiling. If the angle between your leg and the perfect right angle (the vertical) is more than 20 degrees then you would be considered to have tight hamstrings. Note that in order to judge the angle properly you will either need to be looking at a mirror, filming yourself in your phone or getting somebody to watch you. Extra tip: it’s worth doing the AKE Hamstring test on both legs, as sometimes one hamstring can be a lot tighter than the other. 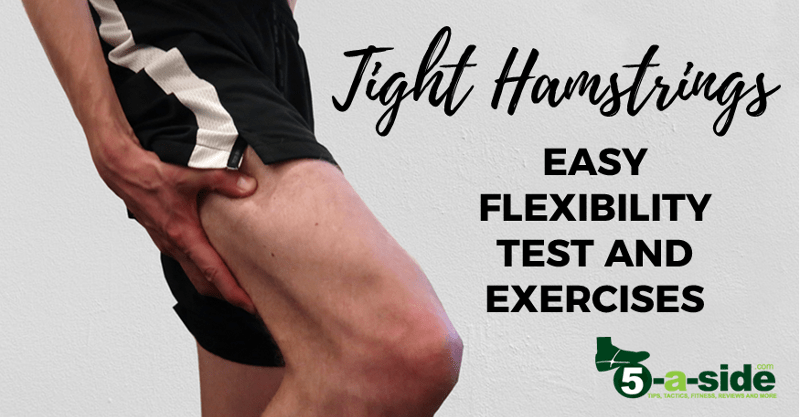 Now you know what causes hamstrings to be tight, the dangers that this brings, and you can accurately work out if you’re suffering with a tight hamstring, it’s time to move on and learn the best stretches and exercises to improve your hamstring flexibility. Hamstring muscle tightness. Reliability of an active-knee-extension test. Gajdosik R, Lusin G.